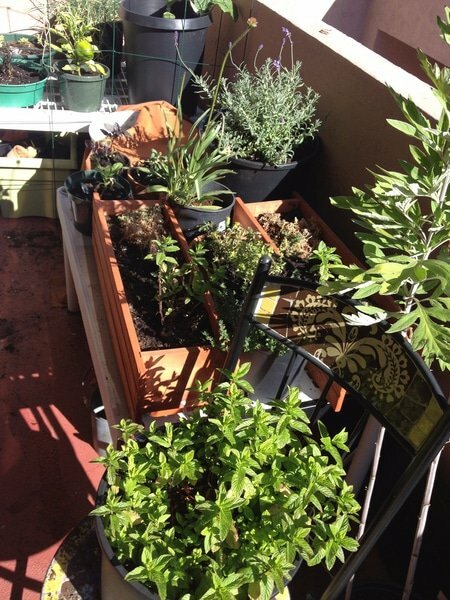 Before I moved to Oakland, California, I had never grown anything in a pot. I was afraid I wasn’t going to do it right and that all my plants would die. I’m very sensitive to the life cycles of plants and it makes me dramatic about my plant friends, but I love them so much I thought I would try anyway and see what I could do. I have since moved and most of these friends are in the ground, but I’m a huge advocate for growing things in whatever space you have. It doesn’t take a green thumb—just love, dirt, and water, really. Research your plants to see what they need and pay close attention to what they might be telling you. 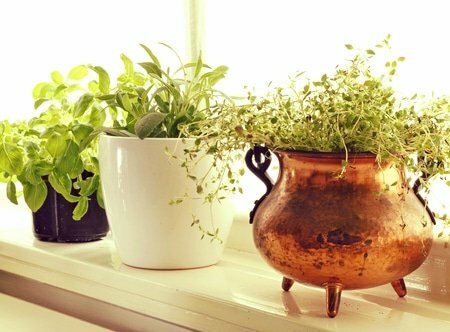 With that in mind, here are three awesome skin care herbs you can grow right out on your porch, in your windowsill, on your kitchen floor, or on your bedside table—anywhere and everywhere that gets the right light for your plants. Traditionally, calendula was used for grief, positive communication, and it is an ultimate beautifier. Calendula is super easy to grow. She LOVES the sun and isn’t too picky about her soil. The more you pick calendula’s flowers, the more she will give. If you’re only halfway through the season and she’s not giving you all the flowers you expected, cut her back a lot and she will start producing all over again! She is an annual plant, but she self seeds like crazy if you leave a flower on, so you need only one plant to create a garden full of them. If I want to take calendula internally, I walk outside, grab a flower, and eat it. YUM! I also love calendula in tea. You don’t need to make a tincture of calendula—she does perfectly well for us as she is—but a tincture is a great way to preserve her through the winter time. Externally, I make calendula into an oil to use on everything. Don't worry, I've got a recipe for ya! Step one: Get a cup of organic oil that you like to work with (I like grapeseed or kukui nut, a light oil) and about an ounce of dry calendula flowers. Mix together in a jar. Step two: Let the jar sit in the dark for 2-4 weeks. Shake it daily. Step three: Strain out the flowers. Voila! You have an oil you can use to make salves or boluses, or to apply to your skin. Comfrey leaves were once used in luggage and in the shoes of travelers to ensure safe journeys. It's a great skin herb as well. It isn’t an herb to take lightly, and very infrequently should one take it internally. Put some strong comfrey tea in your shampoo. To get your body ready for childbirth, use a homemade comfrey oil on your belly. You can grow this friend in any type of soil and any type of light, though it prefers rich, loamy soil and full sunlight. I would suggest putting it in a gallon pot, and re-potting it each year if you want it to get really big. It grows really well if you plant it with a piece of a root, but you can certainly grow it from seed. If you plant it in the ground it WILL take over your space if you let it. You might laugh at this because you probably pull this friend out of your garden several times a year. Indeed it is often a volunteer in places we don’t want to see it, but next time you find chickweed growing in your garden, don’t be frustrated—be excited! Collect the seeds and put them in a pot with some rich soil. Water it a little bit each day. It will grow like… okay… a weed. This friend is absolutely fantastic for skin woes!.You can make an oil with it or use it as a poultice. I would totally add it to my bath water if I needed it. Chickweed is also edible! Eat it raw or cooked like you would with any salad green, or juice it for a delicious drink that is high in vitamin C and contains lots of minerals! For more iron, add chickweed to your diet. Want a Couple More Skin Care Herbs? Growing Arnica might be fun, but it needs a frost to germinate and loves high altitudes. If you’re in one of the mountainous states, try growing it and PLEASE let me know how it goes. You don’t want to take this guy internally without chatting with an herbalist about it, but using it as a poultice or an oil on the skin is amazing. Lavender is wonderful for the skin! It’s super gentle. It can be used everyday and with babies, too! As you can see from my photo above, it does okay in a pot for the first couple of years. Make sure not to overwater it, though, and keep it in the sunshine. Cut it back when it flowers and cut it down to the woody parts at the end of the season. Aloe grows like crazy in pots. I’ve given several of my mama aloe’s pups away to ASC Team Members and one of them lives here in the office! It grows happiest inside with filtered light or outside in places where it gets dappled sunlight. Don’t water too much or too little. It will tell you if you watch it enough. Use it to soothe and hydrate. What’s your favorite potted skin care plant?